Zach and Brad now started casting silver jigging spoons that closely resembled the shad being chased by the schooling whites, and soon each had a nice white bass on his line. 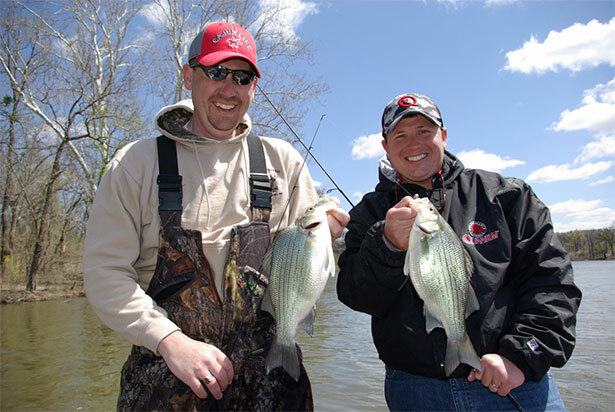 More casts, more white bass, more smiles—the action continued nonstop for two hours. It was an incredibly fun experience that made us forget about the cold. If you understand a few facts about white bass behavior, you should be able to enjoy similar action on top waters throughout the white bass’ range. Before whites move upstream on their spawning runs, they may be 30 or 40 feet down in big lakes, holding in open water around prominent structure like humps or fast-dropping points. The same behavior is observed on rivers, with whites near deep structure like river-channel edges and plummeting holes at creek mouths. Sand structures like bars and flats are especially attractive, hence the common white bass nicknames “sand bass” and “sandies.” Rarely are whites found where brush and big rocks cover the bottom. Smooth-bottomed, open-water areas provide the habitat they prefer. Invaluable equipment for fishing deep structure includes bottom contour maps of the lake, marker buoys to keep you near structure or schools of fish, and a sonar unit that reveals structure as well as fish. Because white bass spend most of their time over clean bottom, it’s easy to locate them with electronics. Check the spots where whites should be, and when you see returns, mark the spot with a buoy and start fishing. A small jigging spoon worked vertically beneath the boat is an excellent lure for deep-water whites. Fish the spoon straight up and down. Jerk it hard, raising it four or five feet, and let it flutter down on slack line. Most strikes come while the spoon is falling, and you probably won’t feel the strike. That’s OK. When you jerk the spoon again, you’ll set the hook. That’s why you jerk hard. Another popular lure is the Blakemore Road Runner spinner. It can be worked up and down points, over and around humps and along deep sand bars and flats. It has what I call a double whammy—the flash of a spinner and the seductive dance of a marabou or rubber-skirted jig all wrapped up in one deadly little package. Work the lure just above bottom where the big sows lurk. Use a varied retrieve—sometimes fast, sometimes slow, sometimes smooth, sometimes jerky. Occasionally, it should fall to the bottom and be ripped upward again. Such shenanigans are usually more than white bass can bear. Yet another method of taking whites on deep winter structure is trolling with deep-diving crankbaits or small jigs on multiple poles. Trolling covers lots of water and produces fish on those rare days when whites won’t cooperate. Trolling also may be the best method for taking suspended white bass holding at mid-depths between the surface and bottom. Suspended fish generally are hard to catch by casting or jigging. When trolling at these greater depths and the fish are not responding, try pumping the rod with a long sweeping action. The lures crawl along, then hop a few feet above the bottom and fall back. This constant series of swimming, diving and jigging actions incites whites to strike. When you get your first strike, take a waterproof felt marker and dab it on your line just ahead of the reel before you crank in the fish. On your next pass through the area, pay out line until the mark shows just ahead of the reel and you know your lure will be traveling at the right depth. If an electrical power plant is adjacent the body of water you’re fishing, be sure to look for white bass in the vicinity. These facilities are hotspots in the literal sense of the term. Lake or river water is used to cool internal machinery, and when the water is returned from whence it came, it’s warmer than the surrounding lake or stream. Baitfish congregate in these warm environs like bathers on a Caribbean beach, and white bass move in to gluttonize the schools. Warmer water raises the metabolic rate of cold-blooded bass, meaning more frequent, active feeding periods during winter. Savvy anglers take advantage of this unique situation. Watch the surface in these areas for skipping shad. 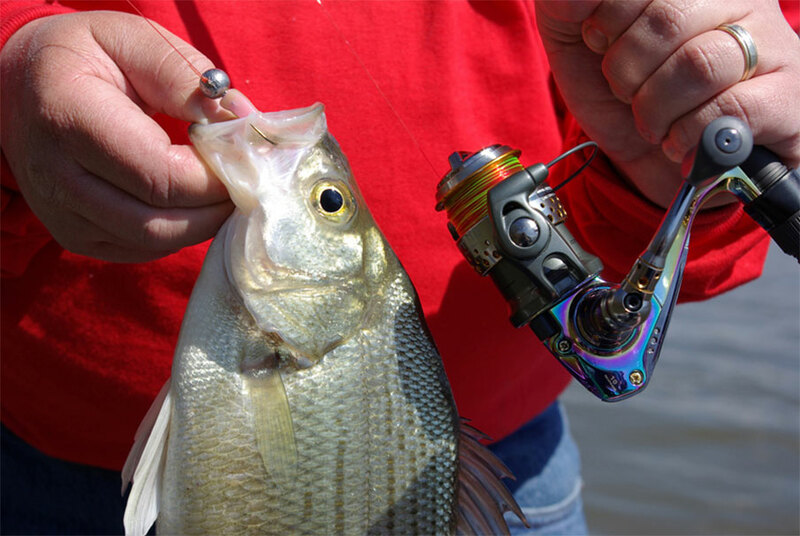 Whites are likely to be after them and can be caught by casting jigs, spinners or small shad-imitation crankbaits near the edge of the disturbance. If there are no signs of surface feeding, try a 1/8- or 1/4-ounce jig cast across or up the current and retrieved at different depths. Let the lure sink three or four feet, and if this doesn’t work, go deeper and deeper until you’re working it just over the bottom. Cold-weather fishing isn’t for everybody. For most of us, a warm fireplace is much more attractive than a frigid outing on a river or lake. If the fishing itch gets too intense to bear, though, be an early bird and give white bass a try. Fishing for these sassy panfish is a sure remedy for what ails you.